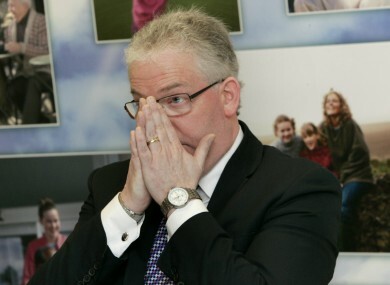 HSE boss apologises after leaked memo said patients could be removed with "minimum force"
Minister for Health Simon Harris said that the rescinded memo was “utterly offensive and unacceptable”. HSE BOSS TONY O’Brien has apologised for any distress caused after a leaked memo said nurses could remove patients from beds “as trespassers” using “minimum force” to free up beds. O’Brien told the Oireachtas Health Committee this afternoon that the memo should not have been disseminated as widely as it was. He apologised for any distress it caused. However, he did say it was drafted based on legal counsel in relation to rare cases where patients refused to leave hospital. Yesterday, Minister for Health Simon Harris said that the memo was “utterly offensive and unacceptable” and had been rescinded. He was agreeing with Liam Doran, General Secretary of the Irish Nurses and Midwives Organisation, who welcomed the retraction but also expressed worry over why the memo included those instructions in the first place. Roscommon-Galway Independent TD Michael Fitzmaurice shared his concern, and said that those responsible for HSE statement on removal of patients should be removed from their roles. “The notion that the HSE would ask nurses to use force to remove patients from beds is absolutely unbelievable and a further indication of the disconnect that there is between some of the people who run our health service and the most important people of all, who are the patients. Email “HSE boss apologises after leaked memo said patients could be removed with "minimum force"”. Feedback on “HSE boss apologises after leaked memo said patients could be removed with "minimum force"”.